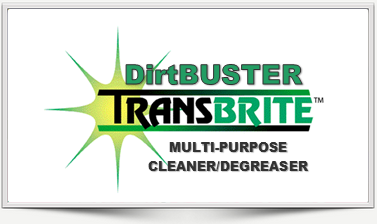 TRANSBRITE DirtBUSTER is a Super Concentrated, Heavy Duty, Multi-Purpose, Alkaline Liquid Detergent capable of cleaning the toughest soils and contaminants associated with today’s remanufacturer & rebuilder. TRANSBRITE DirtBUSTER is capable of cleaning and degreasing everything from hard-surface concrete shop ﬂoors & walls,to equipment, to company vehicles. As a concrete shop ﬂoor cleaner, TRANSBRITE DirtBUSTER will increase employee safety & production while decreasing slip-and-fall accidents and their associated insurance costs. 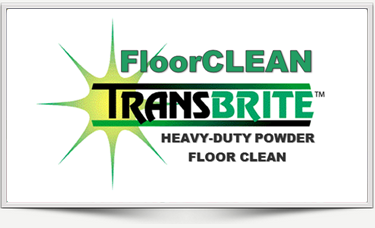 TRANSBRITE FloorCLEAN is a Heavy Duty, High Ph, Low Foaming, Alkaline, Powdered Detergent capable of cleaning and degreasing the toughest soils and contaminants found on today’s manufacturers’, remanufacturers’ & rebuilders’ production shop ﬂoors. TRANSBRITE FloorCLEAN is a superior fast-acting shop ﬂoor cleaner that will increase employee safety & production while decreasing slip-and-fall accidents and their associated insurance costs. 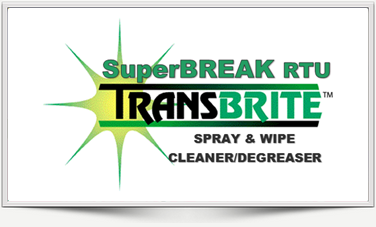 TRANSBRITE SuperBREAK RTU is a Heavy-Duty, Multi-Purpose, Water-Based, Ready-To-Use Liquid Spray Cleaner/Degreaser formulated for the cleaning of all parts & surfaces not harmed by water. TRANSBRITE SuperBREAK RTU is capable of cleaning everything, from floors to ceilings, found in the manufacturing & remanufacturing/rebuilding environment. TRANSBRITE SuperBREAKRTU’s enhanced grease cutting formula is often effective without scrubbing, just spray and wipe clean. TRANSBRITE SuperBREAK RTU removes greases, oils, inks, some paints and heavy soils.